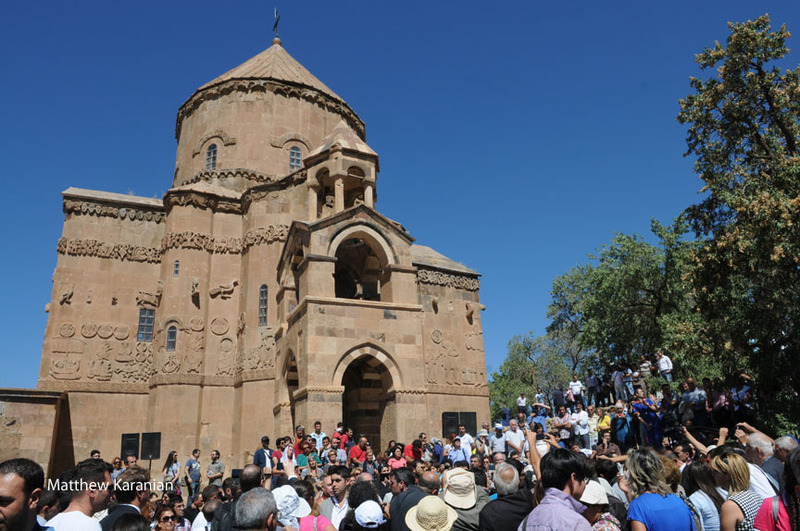 For the first time since 1915, the Armenian Church performed the rite of baptism at the Church of the Holy Cross (Sourp Khatch) on Aghtamar Island in Lake Van. Two adults and three youths, including a boy from Armenia named Van and three Armenians from the town of Van, were baptized. The identity of the fifth person to be baptized wasn’t immediately clear. She had made her way to the altar during the ceremony and announced that she wished to be baptized. The church honored her impromptu request. The five baptisms were conducted on Sept. 8 at the conclusion of a church service—itself a rare event at Aghtamar—that had drawn more than 1,000 visitors from around the world. 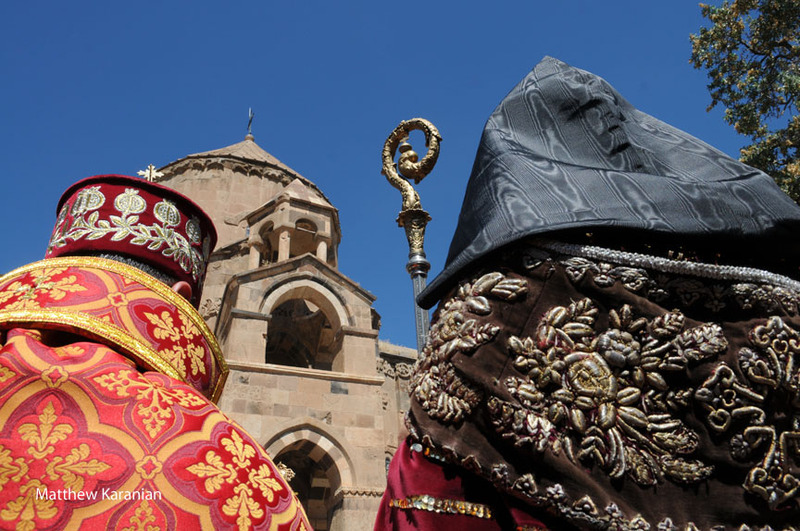 The Divine Liturgy, which Armenians refer to as the Badarak, has been performed only once each year at Aghtamar since 2010, after a genocide-induced hiatus of 95 years. Bartev Karakeshian, a parish priest from Sydney, Australia, was among six visitors from his parish who made the pilgrimage to Aghtamar for the ceremony. A photograph of him standing at the altar and reading the confession appeared in a major Turkish daily newspaper the next morning. The daily newspaper of Van printed a photograph of Father Bartev administering communion. For a moment, and by chance, Father Bartev had become famous. In Turkey, press coverage of the baptisms, both before and after the ceremony, appeared to be matter-of-fact. The media largely announced the event without an expression of opinion. But some in Turkey were opinionated, and a small group of Turks protested the baptisms on the morning of the event. Turkish police, who had a significant presence on and around the island of Aghtamar, did not allow the protesters to board boats to the island. The day concluded peacefully, without any significant incidents, and the protests of the Turkish group went unheard by most. Rosine Dilanian was one of the six Armenians who traveled to Aghtamar from Sydney. This was the first trip to Aghtamar for each person in her group. “This was a dream for us,” she said. 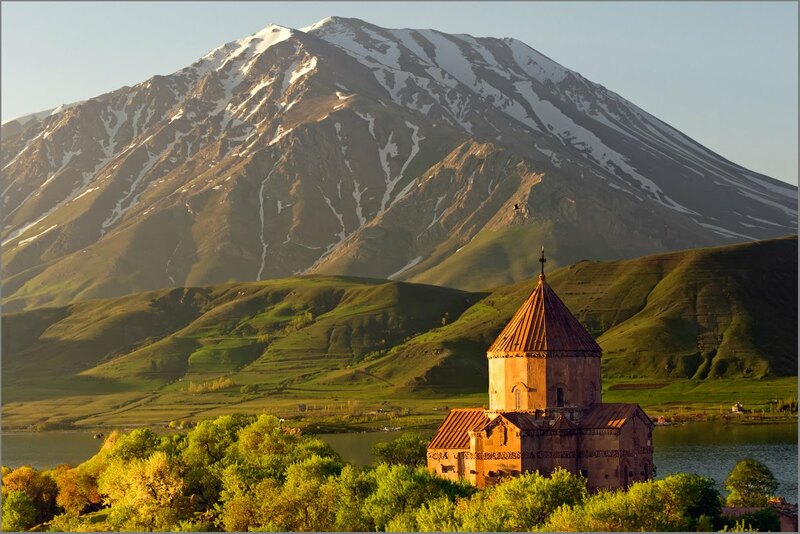 “We have all been to Armenia, but not this part of Armenia,” she added. I spoke to groups of pilgrims on the island after the ceremony. I encountered Armenians from Yerevan and Istanbul who had traveled here expressly for this event. I met the group from Australia. I also spoke with a woman from Los Angeles who, as with the others, had traveled to Aghtamar solely because of the Liturgy. Raffi Hovhannissian, the presidential candidate and former Foreign Minister of Armenia, was also present. The Armenians whom I met from Yerevan had traveled through Georgia to get past the closed Turkish-Armenian border. The Armenians from Istanbul told me, through an interpreter, that they couldn’t speak any Armenian. They explained, in Turkish, that they had flown to Van from Istanbul for the ceremony and that they would stay just one night. By late afternoon, most of the Armenians appeared to have left the island, and the remaining visitors were Kurds, for whom Aghtamar is a picnic destination, rather than a holy site of great significance. I watched the progression of the crowds all day long. I had been one of the first people on the island that day, at about 8 a.m. I departed on the last boat at 7 p.m.
During my 11 hours on the island, I enjoyed being able to publicly celebrate my heritage, and to exercise a privilege that is rarely available in the lands of historic Armenia. I had traveled here to do research and photography for a book about historic Armenia—a sequel, of sorts, to my current book, Armenia and Karabakh: The Stone Garden Travel Guide. The Church of the Holy Cross is commonly known as Aghtamar because of its location on Aghtamar Island. The site was abandoned during the Armenian Genocide. During the decades that followed, this unique 10th-century cathedral fell into ruin and was vandalized. After ignoring the problem for nearly a century, in 2007 the Turkish government completed repairs to the cathedral. The building was opened as a museum, and since 2010 the Armenian Church has been allowed to conduct a Divine Liturgy, or Badarak, once yearly. The ceremony that was conducted on Sept. 8 was the fourth that has been allowed since 1915. The woman who was baptized on this day along with her two daughters was an Armenian living in Van. Her family had been forcibly converted to Islam after the genocide. She is one of the so-called “hidden Armenians” of the region. “But they knew they were Armenians,” said Father Bartev, the pilgrim from Sydney. “They kept saying, ‘We are Armenians, We are Armenians.’” Among all of the Armenians at Aghtamar that day, their journey was the shortest, but also the most difficult. Van, the teenage boy from Yerevan, was brought here to be baptized by his father. “His dream was to come to Aghtamar,” said Father Bartev. The Liturgy began at 10:30 a.m. and lasted about two hours. The baptisms were conducted immediately following the Liturgy with a ceremony that lasted about 30 minutes. At the conclusion of the baptism, the clergy formed a processional outside to the courtyard, where they joined the pilgrims in singing hymns. 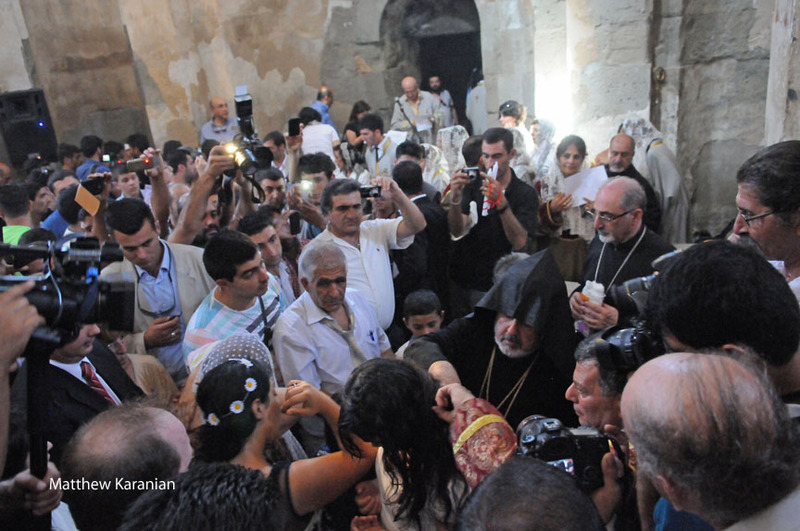 The Liturgy was conducted by the acting head of the Armenian Patriarchate of Istanbul, Aram Ateshyan. Several hours after the baptisms, the sun had stopped shining on Aghtamar and the last boat back to shore was ready to depart. All but a handful of the 1,000 visitors had long gone. As I boarded the boat back to Van, I anticipated another year-long hibernation of Armenian culture on Aghtamar. But I was happy that for one long day, the sun had shined bright. Reblogged this on Notes of a Spurkahye Finally Come Home.